TRACTION INTÉGRALE, NAVIGATION, TOIT-OUVRANT, CAMÉRA DE RECUL PANORAMIQUE AVEC SONAR AVANT / ARRIÈRE ET SYSTÈME DE FREINAGE DE CIRCULATION TRANSVERSALE ARRIÈRE, AFFICHAGE TÊTE HAUTE, MONITEUR D'ANGLES MORTS, SYSTÈME AVERTISSEMENT SORTIE DE VOIE AVEC ASSISTANCE À LA DIRECTION, SYSTÈME DE PRÉ-COLLISION AVEC ALERTE AUX PIÉTONS ET ASSISTANCE À LA DIRECTION, INTÉRIEUR CUIR SUPÉRIEUR / GARNITURE BOIS, SIÈGES AVANT ÉLECTRIQUES / CHAUFFANTS ET VENTILÉS, SIÈGE CONDUCTEUR MÉMOIRE, SIÈGES 2ÈME RANGÉE CHAUFFANT, VENTILATION AUTOMATIQUE BI-ZONE, AUDIO LEXUS ENFORM AVEC ÉCRAN 10.3 / AM / FM / CD / USB / BLUETOOTH / APPLE CARPLAY / RADIO SATELLITE SIRIUS XM INTÉGRÉ À 10 HAUT-PARLEURS, VOLANT DE CUIR / CHAUFFANT / INCLINABLE ET TÉLESCOPIQUE ÉLECTRIQUE AVEC LEVIER DE CHANGEMENT DE VITESSES / CONTRÔLE AUDIO / BLUETOOTH ET RÉGULATEUR DE VITESSE À RADAR, HAYON ÉLECTRIQUE AVEC CAPTEUR ACTIVÉ PAR LE PIED, PHARES DE ROUTES (DEL), CHARGE SANS FIL, JANTES LEXUS 18 UNIQUE, ESSUIE GLACE ACTIVÉ PAR LA PLUIE ET ENCORE PLUS!! 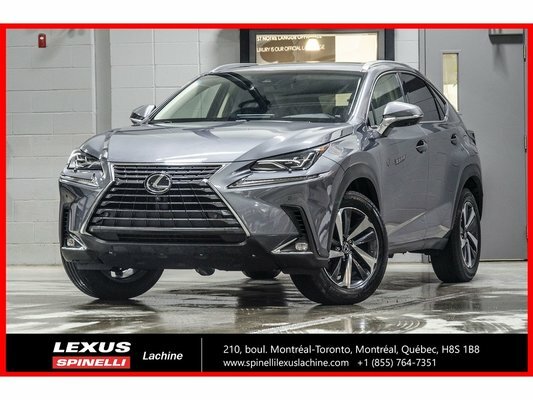 GROUPE EXÉCUTIF AVEC CARACTÉRISTIQUES INNOVATRICES TEL QUE: SYSTÈME DE SÉCURITÉ LEXUS +, SYSTÈME AUDIO ENFORM AVEC APPLICATION ENFORM 2.0, COMPATIBILITÉ APPLE CARPLAY, PALETTES DE CHANGEMENT DE VITESSES ET PHARES À DEL À DOUBLE FAISCEAU. AWD, GPS, MOONROOF, PANORAMIC BACKUP CAMERA W/ FRONT AND BACK SENSORS AND REAR CROSS BRAKING SYSTEM, BLIND SPOT MONITOR, LANE DEPARTURE ALERT W/ STEERING ASSIST, PRE-COLLISION SYSTEM W/ PEDESTRIAN ALERT AND ACTIVE STEERING ASSIST, PREMIUM LEATHER INTERIOR / WOODGRAIN TRIM, ELECTRIC / HEATED AND VENTILATED FRONT SEATS, DRIVERS MEMORY SEAT, 2ND ROW HEATED SEATS, DUAL ZONE AUTOMATIC CLIMATE CONTROL, LEXUS ENFORM AUDIO W/ 10.3 DISPLAY / AM / FM / CD / USB / BLUETOOTH / APPLE CARPLAY COMPATIBILITY / INTEGRATED SATELLITE RADIO W/ 10 SPEAKERS, LEATHER / HEATED / POWER TILT AND TELESCOPIC STEERING WHEEL W/ PADDLE SHIFTER / AUDIO CONTROL / BLUETOOTH AND DYNAMIC RADAR CRUISE CONTROL, POWER BACK DOOR W/ KICK SENSOR, LED HIGH BEAM, WIRELESS CHARGING PAD, UNIQUE 18 LEXUS ALLOY WHEEL, RAIN SENSING WIPERS AND MORE!! EXECUTIVE PACKAGE W/ INNOVATIVE FEATURES SUCH AS: LSS+, ENFORM AUDIO W / ENFORM APP SUITE 2.0, APPLE CARPLAY COMPATIBILITY, PADDLE SHIFTERS AND BI-BEAM LED HEADLAMP DESIGN.